This article comes to us from Washington State University. Think of it as an example of how you might work with partners to demonstrate how managed grazing can improve ecosystems and protect wildlife. Butterflies, cattle, and the military may seem like unlikely bedfellows, but for native prairies — some of the most threatened habitats in the world — the trio are closely connected. 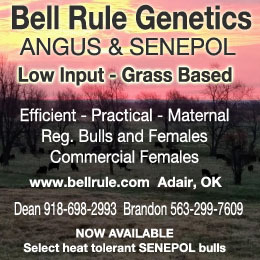 Anecdotal evidence suggests that the improbable pairing of cattle grazing and native prairie conservation is not only compatible, but mutually beneficial. 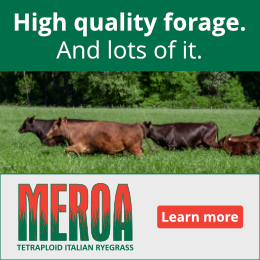 Carefully managed grazing regimes can improve weed control and plant health, help re-establish native plants, and increase plant diversity compared with an unmanaged system. 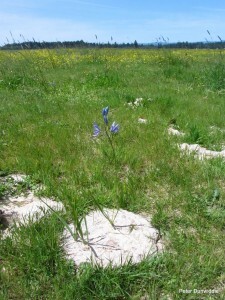 However, until now no systematic study has attempted to track the impacts of managed grazing on native prairie plant communities in Western Washington. Scientists at Washington State University, in partnership with the U.S. Department of Defense and the Center for Natural Lands Management, have established just such a study in order to see how “working landscapes” might support habitat conservation goals. In Washington State, much of the only remaining native prairie lands, are found in Southern Puget Sound including on Joint Base Lewis-McChord in Thurston County. These prairies support a diverse array of plant and animal species at risk for extinction. 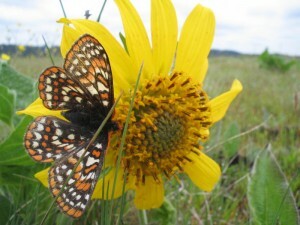 These include the rare, native golden paintbrush, the Taylor’s checkerspot butterfly, and the Mazama pocket gopher, which was recently listed as threatened under the Endangered Species Act. Southern Puget Sound prairies are the focus of the Sentinel Landscape pilot project, a federal, local and private collaboration intended to preserve agricultural lands, plus restore and protect more than 2,600 acres of public and private prairie lands and wildlife habitat. At the same time, the $12.6 million project funded by the DoD, the Natural Resources Conservation Service, and the U.S. Fish and Wildlife Service will reduce restrictions to military training activities on JBLM land. 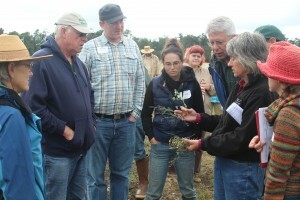 “This is a unique partnership between agricultural and conservation professionals looking to improve productivity and conserve species,” said Lucas Patzek, director and agriculture faculty for WSU Thurston County Extension. “It’s part field research to study how we might be able to integrate native plant species into working livestock operations on South Puget Sound prairies, to extend habitat for the recently listed checkerspot butterfly, and it’s part outreach.”Southern Puget Sound prairies are the focus of the Sentinel Landscape pilot project, a federal, local and private collaboration intended to preserve agricultural lands, plus restore and protect more than 2,600 acres of public and private prairie lands and wildlife habitat. At the same time, the $12.6 million project funded by the DoD, the Natural Resources Conservation Service, and the U.S. Fish and Wildlife Service will reduce restrictions to military training activities on JBLM land. 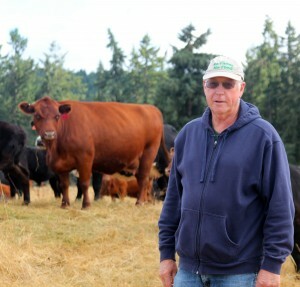 The three-year study includes plots on Fred Colvin’s 550-acre black and red angus cattle ranch in south Thurston County. 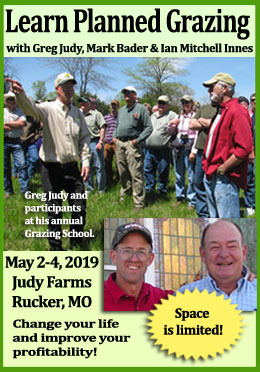 Fencing and research plots were set up on Colvin’s property last fall to measure differences between excluding cattle and allowing them to graze. “They’re trying to figure out whether cattle can be part of a commercial cattle operation plus help as far as the prairies are concerned,” Colvin said. “Frankly, if you don’t have ag on these prairies, you might as well write the prairies off. Because what’s the other alternative use? Forestry? That won’t work. Pavement? I’ll tell you the pocket gopher can’t live under pavement.”Certain fields are managed to improve native plant diversity and cover, while others are managed for a mixture of non-native species such as orchardgrass and tall fescue. As the Sentinel Lands project moves forward, Colvin wants to be sure the needs of the landowner — the ability to have a productive and profitable farming operation — are given priority. Colvin and over 60 other participants who took the course this summer learned about the importance of designating areas for livestock to graze when native plant pastures are either dormant or are being seasonally deferred during critical growth periods of the native species. It’s too early for results, but Patzek expects to find that, through prescribed management, the cattle will selectively graze the non-native perennial grasses that limit the establishment and growth of native species. He also expects that the cattle hoof action will more readily return organic matter to the soil and promote seed contact with soil for improved rates of germination of native plants like golden paintbrush. In the meantime, Patzek will continue to offer workshops for private landowners to better manage agricultural endeavors in Western Washington prairie ecosystems. A series of fall workshops will teach agricultural producers how to conduct ecological site assessments. If you have questions or would like to learn more, contact Lucas Patzek, WSU Thurston County Extension at 360-867-2153, lpatzek@wsu.edu.